Working in customer support, it can be easy to forget the power that each email has to impact a customer’s experience after you’ve been writing them all day. 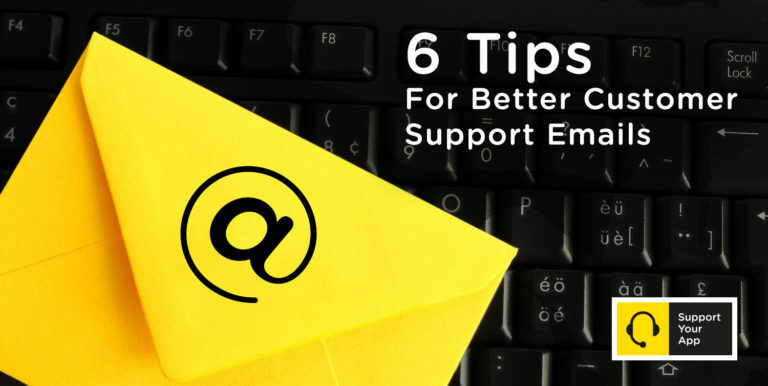 Here are 6 tips that can help you write a perfect customer support email every time. Our customer support email team writes thousands of emails to customers every single day. But we know that any of those emails can be the very first interaction that a customer has with our company. At SupportYourApp we are all about building strong and long-term customer loyalty, but we’re also big on creating great first impressions as well. This is exactly why our main priority is to make sure the quality of each customer support email never loses its strength. Writing great emails is one of the best ways to create a great first impression and strong relationships. Use our 6 tips below to improve every email you send to customers. This might be common sense, but we still see many clients making the mistake of starting out each support ticket with simply “Hi,” or “Hello,”. Not only does it start out an interaction very coldly… it also gives off the impression that the customer is speaking to a robot. Start out the customer support email right by addressing the customer by their first name. Remember, it’s not just another robotic customer support email, it’s an interaction. Keep the conversation casual and polite, but don’t treat it as if you’re talking to a childhood buddy. By introducing yourself, you’re showing the customer that they’re talking to a real human and not just a business. We have a couple golden rules here I hold my team to: Firstly, we try and end on a question… to effectively put the ball back in the customer’s court. This encourages deeper interaction and tells the customer that we care about them. Secondly, never say “I hope this helps”. I hate those words. Ryan Thielen, Director of Support at Procore Technologies, Inc. According to Ryan, ending your customer support email with an unsure statement like “I hope this helps”, is one of the quickest ways to lose your job as a support agent. Might sound harsh, but in the world of customer support, confidence is key. Substituting these weak statements with relevant questions is a perfect way to encourage deeper interaction with each customer. These are pretty generic examples. But try to make them as relevant as possible. It might take a little bit longer, but it ensures a better experience from the customer’s side. Credit to Ryan for this awesome tip! No matter if it’s harsh criticism or a friendly suggestion, always thank a customer for communicating their thoughts on how to improve your product. Constructive feedback is something that every company can benefit from, but don’t get very often. The customer saw a flaw in your product and took time out of their day to let you know about it. Now return the favor with an extra 2 seconds out of your day to express your appreciation. The customer will notice this and continue to give you valuable feedback. You and your developers have a whole vocabulary full of technical jargon that you can use to try and help customers… but for the sake of short interactions and happier customers, leave this talk for the water cooler. You’re an expert on your product, you know it and the customer knows it. But your job as a customer support professional is to refine complex troubleshooting methods into the simplest words possible. This is especially helpful if your product is catered towards those not so gifted in the ways of technology. If it’s absolutely necessary, you can always link to more detailed instructions at the bottom of the email. If you can’t resolve a customer’s issue at that very moment, NEVER LEAVE THE CUSTOMER HANGING. No one ever wants to email support. Saying something like “Sorry, but we’ll have to get back to you on that issue shortly” is the last thing people want to hear during a support interaction. This disdain can be multiplied by 100 times if you don’t update them regularly and especially if you get an angry email after forgetting to get back to them. Making sure we proactively update the customer on the status of their issue at least once a day. We mark these customers with a special tag in our CRM system called “URGENT”. These customers get daily attention if there problem requires speaking to multiple departments. Promising customers specific times when we will reach out to them on the issue. This establishes your company as a source of reliable support and builds trust with customers. By using simple gestures like expressing your appreciation, promising resolutions, and always using the customer’s first name… it’s more than possible to turn a boring, automatic email into a surprisingly personal experience. No matter if it’s the first email of the day or the last, taking these small efforts to perfect your emails can be the difference-maker between average and excellent support. If you liked this article, please show some love and share it below! Great post! Some teams have also had success using emoticons in emails. It can help to convey emotion and friendliness. But it has to work with your brand. Very good tip, but you’re right, sometimes emojis don’t fit well with certain companies and their customer support. I don’t see email going away for a long time as the primary source of customer support.. so I agree, very important to hone those email skills. Another nice tip – depending on your business: Blizzard Entertainment support always throws a joke at the bottom of their emails out. This wouldn’t work in all business spheres, but definitely works in theirs! I thought it was a neat way to make a memorable impression on your client…. to get your clients talking about their experience they had with support, rather then the problem for which they originally contacted support for. Genius! Thanks for sharing another awesome tip Ryan. Unique touches like that are usually a good way to make a lasting first impression. I even see some companies use gifs in support emails (of course they’re a very laid-back brand). Interesting article. I’ve often seen personalized emails perform better compared to generic ones. Personally, i feel that Emails should be created keep one major thing in mind i.e. What will be our reaction if that email is sent to us or what kind of email will really interest us. And holding our side of the bargain is indeed the best thing you can do in an email. No wonder it gives you bonus points. Amazing tips! Adding a bit of personal touch at the end is like a cherry on top for customer service emails. Cracking a joke or simply wishing the customer a good day can change an unpleasant customer service case into a pleasant story customer’s share with their friends. Awesome post! A few groups have additionally had achievement utilizing emoticons in messages. It can pass on feeling and friendliness. however it has to figure along with your brand.